Would you like to save time, money and eliminate error from your company? If so, then RPA is the solution for you! Simply put, robotic process automation means using a robot to automate a certain task. It is not something that is complicated at all nor should you be intimidated by it. Tedious everyday tasks can be done by a robot so you and your employees can focus on what really matters. It will result in increased efficiency and less stress for everyone! When we say your process is automated by a “robot” we really mean a piece of software. If you have a routine task that is repetitive or based on a predetermined set of rules, it could easily be automated by a Robot! An example of this would be data entry. Instead of having a person take a set of data and keying it into different fields, a “bot” would be able to take that data and key it in automatically, reducing human error and speeding up the process.All of the data would be input without you having to do anything. Next time you open up the application where the data is being input, it will already be up to date there for you. Now if you have a more complex process that might involve some thinking or someone to make a judgement call, this could also be automated by a process called Intelligent Automation (IA). RPA is part of this process, but it is taken to the next level if you will. Workflow for example would fall into this category. This means if an invoice for example is supposed to go to a certain employee based off of the amount, workflow would make sure it is routed properly. If you have a process that you would like to automate, but you’re not sure if it is doable, do not hesitate to contact us about it, odds are we can do it for you! Meet George. George is an AP clerk and he is by himself in his department. His responsibilities include receiving and recording invoices that come in every day (about 30 per day), tracking expenses and staying on top of discount opportunities, reports sales taxes, tracks budgets and daily spending, pays employees and prepares checks, maintains and files invoices appropriately to keep for records purposes, along with other tasks. His work days are long and stressful and sometimes he makes small mistakes when inputting numbers form the invoices. Now his company decided to implement RPA in order to compliment his job and so he can focus on the more important aspects of it. When invoices come in, a robot extracts all the data from them and inputs it all into the company’s accounting system into the appropriate fields, all George has to do is check it and approve it. 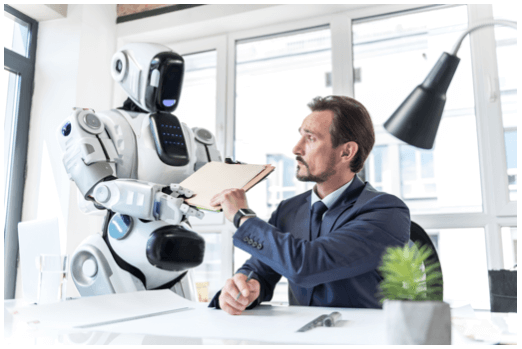 The robot is constantly monitoring vendor discounts and when there is an opportunity, it alerts George and he simply has to authorize it. Employees pay information is all collected and displayed for George, he just has to write the checks. With RPA George is able to focus on the important aspects of his jobs without having to stress over the tedious repetitive tasks. His efficiency and his quality of work are both increased. RPA is something that every company can benefit from! If you want to further educate yourself on this topic, we have a whole ebook about it that will teach you in great detail everything you need to know! Otherwise if you feel comfortable and would like to see how RPA could be integrated into your business processes, contact us for a free consultation!